If Annika Hicks were to list her two biggest passions, skiing and waffles would be at the top of the list. The ‘never say die’ distance specialist spent most of her life on the ski trails in Canmore, Alberta, fueled by maple-syrup strewn waffles. When finances became tight, she and Jesse Cockney paid for their skiing, naturally, by selling waffles at farmer’s markets and special events around her mountain town. 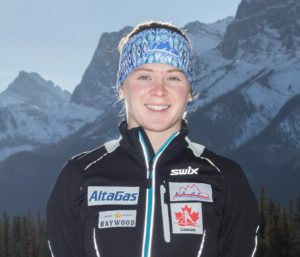 Hicks began skiing with the Canmore Nordic Ski Club, where she rocketed up the national rankings as a junior, and began to make her mark on the NorAm circuit. She made her World Cup debut in 2012, and after battling injuries for a year and a half, made her return to the top level as a member of Canada’s Ski Tour Canada team in 2016, finishing in the top-50. After the injury hiatus, Hicks rejoined the AWCA team and is now back on track to chase her Olympic dreams. She missed the early part of this season with illness, but is ready to race this weekend in Pyeongchang, South Korea along with the rest of Team Canada. A veteran leader on the young AWCA team, Hicks has shown resilience and determination throughout her career. Cheer her on as she makes her first World Cup start of 2017, and is on the hunt for more sweet snacks on the road.